Norwegian Cruise Line’s Norwegian Getaway will feature an ice bar on board, similar to what’s currently on sister ship Norwegian Breakaway. The Svedka/Inniskillin Ice Bar will be kept at 17 degrees and will feature South Florida-inspired elements. The bar, seating and glassware will be made of ice. It will accommodate about 25 guests at a time. They will wear hooded coats and gloves. Entrance can be reserved from 5:30 to 10:30 p.m. nightly. The $20 cost includes two cocktails. 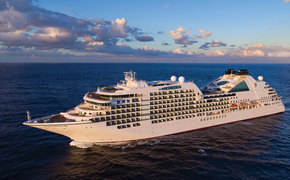 The ship will debut in Miami in February 2014.